Hajimemashite! meaning How do you do? Dining at a Japanese Restaurant just make me want to visit Japan more, I really miss my childhood days back when we will go on vacation to Japan with great food and the kawaii stuffs. It's funny when people I just met thought that my husband's last name is Kawasaki and I was formerly Ms. Rivera, so just to inform everyone is the other way around. Lol! I can still understand a little bit of Japanese as being half and half and growing up going on vacation in Japan every year, I even tried to study in a Japanese language school here in the Philippines but I guess if you do not really use the language you will just forget about it. ♥ Nope, we do not own the Kawasaki Motorcycle or Company but how I really wish we did. 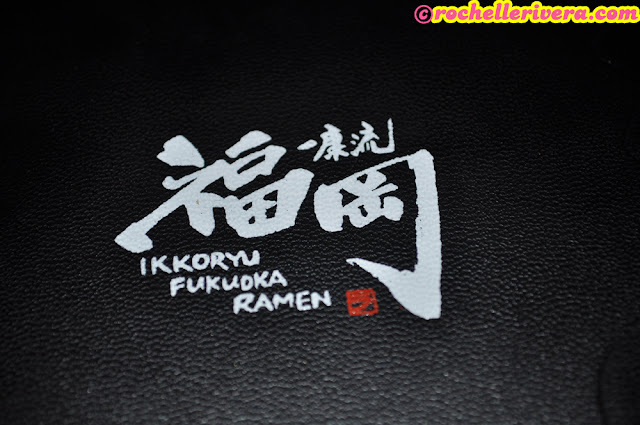 I was invited to have a food tasting at IKKORYU FUKUOKA RAMEN in Rockwell last August 23, Friday for dinner. There was a lot of people dining at the time and it was really full house with long line waiting. We are so much grateful that we have been still accommodated for some fun food tasting. Ramen is a Japanese staple and considered Soul food by young and old alike in Japan and all over the world. Tonkotsu Ramen, a very popular regional style of ramen, is a specialty of its origin Kyushu region in Japan. It is characterized by thin, straight noodles in rich creamy pork broth, which is the result of boiling pork bones with several seasonings for many hours to ensure the rich pork extract and hearty flavour. This is a must try! I love the sauce to dip your gyoza on it, soo good, ahhh!!!... It has a tasty dumpling filled with minced pork and chives that has a nicely toasted texture and juicy on the inside. It's crispy and the meat is juicy! Topped with a special half-boiled egg that is fully marinated with a special blended soy sauce base. Upon ordering the Ramen noodles, You will be asked if you want your noodles soft, medium, hard or very hard? Yup, as for me I like it Al dente. Tonkutso soup mixed with special roast garlic oil. My least favorite, it was just not my liking for my taste buds but it was definitely the best seller! If you love garlic and enjoy strong flavors in your ramen then I would recommend this! My second favorite, If you love spicy foods like me, then you will surely enjoy and love this! STEP 1. Once ramen is served, inhale rich aroma of tonkotsu soup wafting out from the bowl. It must be most appetizing moment! STEP 2. Gently scoop up soup with spoon and take a first sip. Pause and take a moment to enjoy truly indulgent taste of tonkotsu soup. STEP 3. Start tasting noodle. Fully dip the noodles into tonkotsu soup, and slurp it up! Noise of slurping "zu zu zu..." sounds are considered courteous in Japanese custom. STEP 4.For more authentic CHIKUHO local way of eating, lightly powder grained sesame seeds and/or add a little of red ginger pickles into soup. This finely spices up a bowl to make the experience even more exquisite. STEP 5.After finishing the noodles, put rice into soup to enjoy the last pleasurable drops of the soup! "GOCHISOOSAMA" meaning That was delicious! Have you tried IKKORYU FUKUOKA RAMEN? Level 5 East Wing, Shangrila Plaza, Edsa cor. Shaw Boulevard, Mandaluyong, Philippines. Another starving post! Yum!!!! Reading you tips about enjoying ramen made me more hungry :'( I tried Chicken Karaage but from different restaurant, it tastes really good. I love your food reviews, they're usually affordable .. and really looks delicious. Thanks for the tips on how eat Ramen more enjoyable. Wow! meron din pala translation dito sa blog mo,galing naman. Yup it's from the menu :-) A little japanese I know. I love Ramen, specially the Tonkatsu Ramen. I used to have a Japanese boss before who doesn't know how to speak Tagalog or even English so I tried to study Japanese Language. I can understand few words or some sentences but can't speak Japanese fluently. Hope to try this restaurant too. Oishisō! hahaha I tot that way too..i was looking closely pa last time sa pic ng hubby mo and thinking if mukha ba xang hapon,hahahs. no wonder u have a beautiful white skin before u have a japanese blood pala... btw, without tasting it yet i think i wud love Spicy Tobanjan Tonkotsu,simply bec it's spicy lol.. really love spicy foods... especially spicy ramen..
Lol @Kristine :) Yes I love spicy foods too. Thank you! until now natatawa pa rin ako, binabalik balikan ko tlga ung pic nyo ni hubby mo..
Wow, I love Japanese food! Nakakagutom naman yung ramen! Hope I can visit this resto!